Playing the piano is not easy. If it were, surely everyone would want to do it? We know that to succeed as a pianist requires practice, and lots of it. But how do we practise? What exactly do we need to do day by day to reach our goals? There are many books on piano playing, but surprisingly few that deal with the art of practising. Given the amount of time an aspiring pianist needs to spend at the instrument on a regular basis, it is surely very important to know exactly what to do, and how to make the best use of this time. Practising the Piano is directed at serious students of the piano of all ages. It will be as useful for the advanced player as for the intermediate level, and will be of special interest to piano teachers. It will equip you with specific tools to help you every step of the way, and give you concrete skills to learn pieces, solve problems, memorise and much more. You’ll notice real results in your playing – guaranteed! Practising the Piano eBook Series - including all the information, free previews, or to purchase the publications. About the Author Graham Fitch is a pianist and teacher with many years of experience teaching at the college level. For over a decade, he was Head of Keyboard at the University of Cape Town, and has also taught at the Royal Welsh College of Music in Cardiff and the Mannes College of Music in New York. He is also known as a teacher for specialist young pianists, and has been on the piano staff at The Purcell School and The Centre for Young Musicians in London. Graham is a regular contributor to Pianist magazine and an adjudicator for the British International Federation of Festivals. Currently, Graham teaches privately in London and attracts a steady stream of students from around the world for lessons. 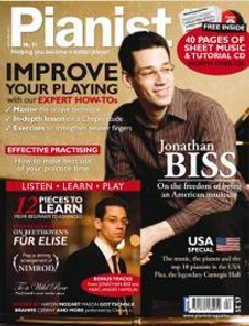 Check out Practising The Piano - a free resource with over 100 articles on many areas of piano playing. The topics covered include how to practise really slowly, tips to correct errors, how to memorise and how to deal with nerves and prepare for exams and performances.